WASHINGTON, DC, December 6, 2013 (ENS) – By fiscal year 2020, 20 percent of the total amount of electric energy consumed by each federal agency shall be generated from renewable sources, President Barack Obama directed today in a memorandum establishing new goals for renewable energy and energy management practices in government. The agencies must comply, “to the extent economically feasible and technically practicable,” Obama wrote. The memo directs agencies to update their building performance and energy management practices by encouraging the use of the consensus-based, industry standard Green Button data access system and the Environmental Protection Agency’s Energy Star Portfolio Manager. 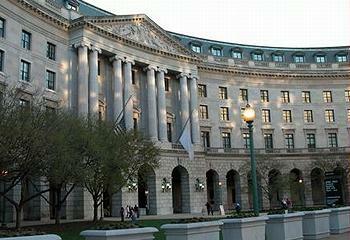 The General Services Administration, in coordination with the Department of Energy and the EPA, shall prepare and initiate a strategy to pilot Green Button at federal facilities where feasible, Obama directed. The EPA shall update Energy Star Portfolio Manager to facilitate the inclusion of building energy usage data using the Green Button system. To better manage building performance, enhance energy efficiency, and reduce energy waste, each agency must install building energy meters and sub-meters and enter the meter data into the EPA’s Energy Star Portfolio Manager. Agencies shall install agency-funded renewable energy on-site at federal facilities and retain renewable energy certificates. Agencies shall ensure that 100 percent of this renewable energy is produced by new renewable sources. Agencies shall consider opportunities to install or contract for energy installed on current or formerly contaminated lands, landfills, and mine sites, Obama directed. Renewable energy consumed by federal agencies shall be not less than 10 percent in fiscal year 2015; not less than 15 percent in fiscal years 2016 and 2017; not less than 17.5 percent in fiscal years 2018 and 2019; and not less than 20 percent in fiscal year 2020 and each fiscal year thereafter. Also this week, the Obama administration extended the use of performance-based contracts through 2016 for agencies to upgrade the energy efficiency of federal buildings. The Departments of Energy and Housing and Urban Development expanded the Better Buildings Challenge to multifamily housing. They announced 50 multifamily partners, representing about 200,000 units and over 190 million square feet, that have committed to cutting their energy use by 20 percent in 10 years. During the Obama Administration, federal agencies have reduced their annual greenhouse gas emissions by more than 15 percent (7.8 million metric tons) – the equivalent of removing 1.5 million cars from the road. WASHINGTON, DC, December 6, 2013 (ENS) – The National Marine Fisheries Service today permanently extended the Final Rule Implementing Vessel Speed Restrictions to Reduce the Threat of Ship Collisions With North Atlantic Right Whales. This regulation mandates a 10-knot ship speed rule on the East Coast of the United States for vessels over 65 feet long, protecting the Critically Endangered North Atlantic right whale from extinction. In 2008, Bush administration officials demanded the inclusion of a “sunset” provision in the original rule terminating the speed limits after five years. That clause was set to expire on December 9. Atlantic right whales have been protected as an endangered species for more than 40 years, but their population remains at fewer than 500 animals. Their feeding, breeding and nursing grounds along the East Coast are in the same places as some of the nation’s busiest shipping ports and ship strikes remain one of the top threats to their survival as a species. The Center for Biological Diversity, the Humane Society of the United States, Whale and Dolphin Conservation, and Defenders of Wildlife petitioned the Fisheries Service in June 2012 to make the ship speed limit rule permanent. 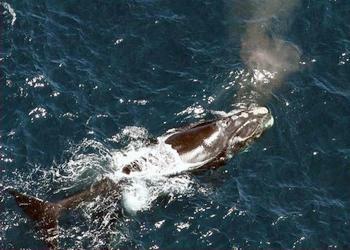 North Atlantic right whales were nearly wiped out by commercial whaling. Despite being protected by the Endangered Species Act since 1970, they have not recovered. Adult female right whales give birth to just one calf every four years. The whales, reaching 55 feet in length, migrate from calving grounds off the southeastern United States to feeding grounds off the northeastern United States and Canada. Before the first speed limits were set in 2008, one or two right whales were struck and killed or very seriously injured each year. An April 2013 scientific report found that speed limits have reduced the number of vessel-related right whale deaths by 80 percent to 90 percent. Slowing ships reduces vessel collisions with other protected species, including blue, humpback, fin and minke whales. Slower ships also produce less underwater noise pollution and air pollution, including greenhouse gas emissions, say the conservationists. The right whales also are threatened by entanglement in commercial fishing gear, habitat degradation, rising noise levels, global warming, ocean acidification and pollution. WASHINGTON, DC, December 6, 2013 (ENS) – The Interior Department today announced a new rule that extends from five to 30 years the time frame of eagle “take” permits issued to wind energy and other developers under the Bald and Golden Eagle Protection Act. The American Wind Energy Association welcomed the final rule, but bird conservation groups were unanimous in their condemnation of the rule, because it is voluntary and relies on companies to report their own violations. In 2009, the Service began a five-year permitting program that allows authorization of the “programmatic take” of eagles, which is killing of eagles associated with, but not the purpose of, an otherwise lawful activity and which does not have a long-term impact on the population. When the 30-year permit action was proposed in April 2012, the National Park Service opposed it, along with nearly 120 conservation, wildlife, and animal protection groups, including the Sierra Club, National Audubon Society, Defenders of Wildlife, National Resources Defense Council, and The Nature Conservancy. Native American groups such as the Hopi Tribe, the Nez Perce Tribe, the Intertribal Council of Arizona, and the Salt River Pima-Maricopa Indian Community have also expressed opposition to the change. The Interior Department says the maximum permit tenure of 30 years, will be subject to a recurring five-year review process. Only applicants who commit to adaptive management measures to ensure the preservation of eagles will be considered for permits with terms longer than five years. A 2004 study prepared for the California Energy Commission estimates that 95 eagles were killed annually at the wind facilities at Altamont Pass in California. Over the 30-year operation of those facilities, as many as 3,000 golden eagles may have been killed, with no federal prosecution. NEW YORK, New York, December 6, 2013 (ENS) – A New York antiques dealer was sentenced in federal court in Manhattan Thursday to 37 months in prison for conspiracy to smuggle Asian artifacts made of rhinoceros horn and ivory and violate wildlife trafficking laws. Qiang Wang, aka Jeffrey Wang, was arrested in February as part of “Operation Crash,” a nationwide crackdown on the illegal trafficking in rhino horns, for his role in smuggling “libation cups” carved from rhino horns from New York to China. In China, there is a tradition dating back centuries of intricately carving rhinoceros horn cups. Drinking from such a cup is believed to bring good health, and antique carvings are prized by collectors. The escalating value of such items has resulted in an increased demand for rhino horn that has helped fuel a thriving black market, including fake antiques made from more recently hunted rhinos. Due to their dwindling populations, all rhino and elephant species are protected under international trade agreements. In pleading guilty, Wang admitted to participating in a conspiracy to smuggle objects carved from rhino horn and elephant ivory out of the United States knowing that it was illegal to export them without required permits. Wang falsely labeled the packages and did not declare them as required. Special agents with the U.S Fish and Wildlife Service executed a search of Wang’s apartment in Flushing, New York, and found documents showing Wang was involved in buying rhino horn and ivory artifacts and smuggling them to China. Agents seized two ivory carvings that were forfeited as part of the sentence. Numerous photographs of raw and carved rhino horn were found on Wang’s computer and phone consistent with a common practice of emailing or texting photographs of items for sale in order to receive instructions on whether to purchase the items and how much to pay. In addition to the prison term, U.S. District Judge Katherine Forrest sentenced Wang to 37 months behind bars plus three years of supervised release. He is banned from all future trade in elephant ivory and rhino horn. WARREN, Michigan, December 6, 2013 (ENS) – General Motors and the U.S. Army are poised to begin joint hydrogen fuel cell testing at the Army’s new Ground System Power and Energy Laboratory (GSPEL) in Warren. TARDEC, formally called the U.S. Army Tank Automotive Research, Development and Engineering Center, will host senior government and industry executives at a launch event on December 16. First announced September 30, this collaboration aims to develop technologies that meet the requirements of both GM and TARDEC more efficiently than either could achieve on its own. The project is expected to continue for up to five years. The tests of new hydrogen fuel cell-related materials and designs will evaluate their performance and durability before they are assembled into full-scale fuel cell propulsion systems. “GM welcomes the opportunity to further expand our work with TARDEC developing fuel cell technology,” executive director of GM’s global fuel cell engineering activities, Charlie Freese, said in September. “We believe hydrogen fuel cell technology holds tremendous potential to one day help reduce our dependence on petroleum and we are committed to building on our leadership through the continued development,” Freese declared. The Army says fuel cell technology helps address the two major challenges – petroleum use and carbon dioxide emissions. Fuel cell vehicles can operate on renewable hydrogen that can be made from sources like wind and biomass. The only emission from fuel cell vehicles is water vapor. GM is staking out a leadership role in fuel cell technology. According to the Clean Energy Patent Growth Index, GM ranked No. 1 in total fuel cell patents filed between 2002 and 2012. GM’s Project Driveway program, launched in 2007, has accumulated nearly three million miles of real-world driving in a fleet of 119 hydrogen-powered vehicles, more than any other automaker, the company says. A new Fuel Cell Development Laboratory, where the majority of the company’s fuel cell development work will take place, is under construction in Pontiac, Michigan. TARDEC’s fuel cell lab is just 20 miles away, making daily collaboration easy; GM and TARDEC engineers already have extensive plans to share physical material and data between the two locations. This is the second fuel cell-related announcement General Motors has made this year. In July, GM and Honda announced a long-term master agreement to co-develop a next-generation fuel cell system and hydrogen storage technologies, aiming for the 2020 time frame. Also, TARDEC is evaluating GM fuel cell vehicles in a comprehensive demonstration in Hawaii. Powered by renewable hydrogen, the military fleet of 16 hydrogen fuel cell vehicles travels up to 200 miles on a single charge, refuels in five minutes and produces zero emissions. Another fuel cell-related project aims to develop technology for lightweight, portable prototype systems that would convert Jet Propellant 8, commonly referred to as JP-8, to hydrogen on the spot. SACRAMENTO, California, December 6, 2013 (ENS) – A U.S. District Court has ruled in favor of increased protections for Tahoe National Forest from motorized off-road vehicles. In a lengthy oral ruling delivered from the bench November 22, Judge John Mendez of the U.S. District Court for the Eastern District of California denied a challenge to the forest’s plan to limit the damages that motor vehicles inflict on the forests. The nonprofit environmental law firm Earthjustice, representing The Wilderness Society, the Sierra Club, Forest Issues Group, Sierra Foothills Audubon Society, and Public Employees for Environmental Responsibility, intervened in defense of the U.S. Forest Service’s plan for Tahoe National Forest. Under the plan upheld by the court, much of the forest is open to motorized vehicles, but some sensitive parts of the forest are off limits.